Delhi to nainital car rental services with best holiday package for you. Nainital is Located at an altitude of approximately 2,084 meters above the sea level, Nainital is a popular hill station in the state of Uttrakhand. The town is located alongside the foothills of the Kumaon region of the outer Himalayas. The town is famous for its various natural attractions and due to its favorable climate all year round is one of the most popular hill stations in India. 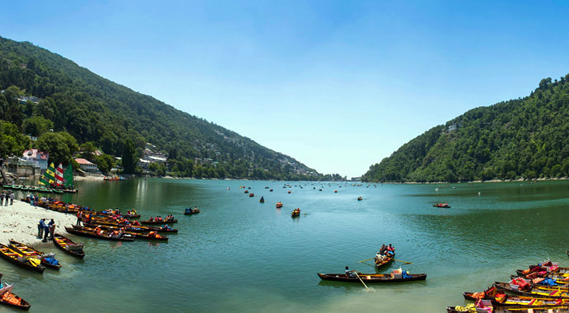 Also famously known as 'City of Lakes,' Nainital abounds in natural beauty, with its snow-capped hills and tranquil lakes lending it a nostalgic charm of its own. Situated at an altitude of 1938 km above sea level, Nainital has a pleasant climate all year round, and can rightfully be called a picturesque paradise for all travel lovers. Whether you're going for the weather, the lakes, the adventure, the food, or even the shopping, Nainital has something for every tourist. The Naini Lake flows through the heart of the city and is a popular spot for various activities such as paddle boating and row boating. Other lakes that you can visit are the Sariyatal Lake, Bhimtal Lake, and Khurpatal Lake. Even if you don’t want to go on a boat ride, you can simply take a walk along the promenade on the banks, and you will still be able to enjoy the ethereal beauty of the lakes. Owing to its gorgeous landscape, Nainital has quite a few hilltops that offer extraordinary vistas of the city and its surrounding regions to visitors. These include Naina Peak, Tiffin Top, and Snow View Point, all of which are very popular tourist spots. Nestled amidst the township of Nainital, Naini Lake is a beautiful natural fresh body lake. The lake is in crescent or kidney shape and is one of the famous lakes of the Kumaon region. Bounded by Naini Peak on North West, Tiffin Point on the South West and snow-capped peaks on the north, the lake offers a breathtaking view, especially during early morning and sunset. Coniferous trees that cover the hillside add charm to the raw beauty of the place. One can also visit Naini Temple on the shores of the lake. A pretty lake that once a European man fell in love with, Naini Lake today serves as a major tourist spot for people from all over the country. The Naini Lake is a charming beauty that is surrounded by seven different peaks namely Ayarpata, Deopata, Handi Bandi, Cheena Peak, Alma, Laria Kanta and Sher Ka Danda. The lake itself can be divided into two distinct sections, the northern part called Mallital and southern region called Tallital. Naini Lake is most famous for its wonderful scenic beauty which is a hotspot for family picnics. Boating, long evening walks and endearing interactions with ducks are some of the things that are a must do whilst visiting this glittering lake. You can also seek the blessings of Goddess Naina Devi at the Naina Devi temple which is also situated near the Naini Lake. Famous for its inter connected rocky caves, hanging gardens and the musical fountain, the Eco Garden are a set of six small caves in the shape of various animals. In the evenings, you can see the spectacle of the musical fountain with various audio video effects. Regarded and revered as one of the fifty-one Shakti Peeths that are located all across India, the Naina Devi Temple is a holy site that is situated on the northern shore of Naini Lake, in the Nainital district of Uttarakhand, India. This temple is one of the most renowned places of Hindu worship all over the country. Dedicated to Devi Sati's eyes, devotees from all parts of India flock to this region in huge numbers all year round. The temple was built in the 15 A.D. while the idol of Naina Devi was installed in the temple in 1842 by a devotee of the goddess named Moti Ram Shah. Unfortunately, the temple got demolished in 1880 due to massive landslides. It was then rebuilt again in 1883 by the local inhabitants of the area. This shows their immense faith in the goddess as well as their firm belief in their religion and values. The presiding deity of the Naina Devi Temple is Maa Naina Devi or Mata Sati. According to Hindu mythology, the temple is built on the exact spot where Goddess Sati's eyes fell on the Earth after Lord Shiva carried her charred body after taking it out from the fire of the yagna that was performed by Sati's father- Daksha. Inside the Naina Devi Temple, you will find the two eyes on the roof, depicting the Goddess Naina Devi, placed in the centre; with the statues of Goddess Kali and Lord Ganesha surrounding it. It would be interesting to note that the city of Nainital got its name from the temple of Naina Devi only. As you climb the hill to reach the temple, various shops selling prasad and other essential puja items will greet you on the way. Considered to be extremely pristine and sacred by the devotees, the venerated temple is a must visit on your next trip to Nainital. Known as the Gateway to Naini Lake, Jeolikot is a pristine hill station brimming with life, colors and butterflies. It is famous for its butterfly population along with its floriculture. In midst of formidable neighbors such as Nainital, Mukhteshwar and Jim Corbett National Park, Jeolikot remains untouched by all the tourist rush that gather around it. It is located just off NH 87 and is a favourite for naturalists and poets. Visit Jeolikot for its enchanting beauty, stunning colors and lush greenery, amidst distant views of the Himalayas. Snow View Point in Nainital stands at a dizzying altitude of 2270 meters above sea level and is hands down, one of the most attractive tourist spots of the area. As the name suggests, Snow View Point offers a panoramic view of the mighty Himalayas draped in a blanket of milk-white snow. Enveloped in cotton clouds, the peaks of these mountains ranges pierce the sky and are enlightened with shafts of sun rays that make the snow sparkle with joy. A single glance at the mesmerising Himalayas is sure to lift your spirits as nothing else will. One can see a picturesque view of all three important peaks- Nanda Devi, Trishul and Nanda Kot peaks together from this point. Known as the daughter of the Himalayas, Nanda Devi (7816 m) is a two-peaked massif- eastern summit Sunanda and western summit Nanda, and is the second highest peak in India. The Trishul peak (7120 m) is the highest of a group of three mountain peaks that resemble the structure of a trident and hence, is named so. The Nanda Kot peak (6861 m) means Nanda's fortress. According to ancient Hindu scriptures, Goddess Parvati has made her sanctuary in this peak making it her sacred abode. A huge pair of binoculars has been installed at the Snow View Point that allows you to take a closer look at the Himalayan range and its magical peaks. If you look closer, you will find a small temple housing the images of Ram, Sita, Laxman, Hanuman with Durga and Shiva. An aerial cable car connects you to the Snow View Point directly from the Mall Road of Mallital and shows you a spectacular view of the beautiful town. There are some adventure options available also in this area. During some seasons, paragliding opportunities are available. There are some nearby short trekking routes as well. One can trek to nearby Naina/China peak which is the highest point in this region and is not so strenuous. This point offers a marvellouis 360 degree view of the entire surroundings. Tourists can also enjoy the game of golf at the Himalayan Mini Golf club. Also called the China Peak, this range located at a height of 2615 m is a challenging trek. The way up the slope is dotted with beautiful rhododendron bloom. From the peak you can view the Tibet Border and Nanda Devi Peak. Located in Ayarpatta Hill of Himachal Pradesh, Tiffin Top is a very famous tourist attraction in Nainital. A fantastic picnic spot in its own right, one gets a complete view of the town of Nainital and its surrounding hills in the Kumaon region from this location. Its serene and peaceful environment makes it irresistible to the photographers. Those who love nature's beauty must not miss out on this vacation spot. Adventure activities such as rappelling and rock climbing are conducted in Tiffin Top as well. The attraction got its name as Tiffin Top after people started to have lunch on top of the hill on Dorothy's Seat. Tiffin Top is also called Dorothy's Seat because it was constructed in the loving memory of the English artist named Dorothy Kellett by the army officer Col J.P. Kellett. The officer lost his wife Dorothy whilst she was aboard a ship to be with her four children. She was buried in the Red Sea in the year 1936. The beautiful Tiffin Top is surrounded by trees of Cher, Oak, and Deodar. Naini Lake and Kumaon Hills look lovely when seen from here. On clearer days, one can also get hold of the majestic view of Nanda Devi. 5 km off Nainital, this locale offers views of the Himalayan Mountains and is located at 2300 m high. The Neem Karoli Baba Ashram is a quaint little ashram that is located in the foothills of the Himalayas in Uttaranchal. Situated at the height of 1400 metres above the sea level, this modern pilgrim centre has been built in dedication to Shri Neem Karoli Baba Maharaj Ji, a saint who is well known not only across the country but rather all over the world. This Hindu guru was a devotee of Lord Hanuman and is reputed to have performed many miracles throughout his life. The ashram serves as the perfect image of silence and solitude, for it is tucked away in the foothills, with lush greenery surrounding it. There are not even telephone lines surrounding the temple, which means that devotees cannot be disturbed by the outside world in any way and continue with their devotion and meditation undeterred. Devotees can even stay at this ashram, which is an altogether different and solemn experience that is hard to put into words. Of course, these devotees are expected to partake in the morning and evening rituals of the ashram without fail, but they gladly do so. A visit to the Neem Karoli Baba Ashram thus is a must, not only for staunch devotees of Maharaj Ji but for any and every one who wishes to spend a day in peace and silence. Set across the Khurpa Tal and vast stretches of plains, the Land's End 4 km off the main town is dotted with quaint little hamlets and lush greenery. You can take a pony, horse or taxi from the city. Home to the popular golf course, the Governor's House is a Victorian Gothic edifice built in 1899 by designer F.W. Steven. It resembles the Castle of Scotland very closely and consists of two stories of buildings with 113 rooms, garden, swimming pool and of course, the golf-course. During British Times, it served as the summer residence of the Governor of North East Province. PangotLocated just 15 kilometres away from Nainital; Pangot, located in the Kosiyakutoli tehsil of the Nainital district of Uttarakhand is a small and picturesque hamlet. The village is at the height of 6,300 feet above the sea level and is well known all across the nation for its rich and exotic bird life and abundance in other natural treasures. The place seems to have sprung up right out of a beautiful novel- with its greenery, flowers and birds. The area also becomes a hub for photography when hundreds of different species of birds flock here during the harsh winters in the upper Himalayas and settle down here temporarily. A step into the wilderness of Pangot, and you will find yourself in the midst of a remote Himalayan village. The entire drive that reaches up to this marvellous area passes through the forested areas of Chenna Peak Range via Snow View Point and Kilbury, both of which are famous and excellent habitats for birding. A myriad of bird species can be seen along the way to Pangot. Some of these include Rufous-bellied Woodpecker, Spotted & Slaty-backed Forktail, Himalayan Griffon and Khalij pheasant. Spotting mammals like Yellow-throated Himalayan Marten, Sambhar, Himalayan Goral, Leopard Cat, Serow, Wild Boar, Red Fox etc. is also not uncommon. The famous Corbett National Park is situated just 80 kilometres from Pangot. Thick oak, pine and Rhododendron can be found dominating the vegetation of Pangot and nearby areas. The streams that pass by further enhance the aesthetic appeal of this breathtakingly fantastic sight. Undoubtedly, Pangot is the apt place for a small vacation with your partner, or the entire family, wherein you can simply lay back and relax. Perched atop 6,401 ft. high, the temple was built by a local saint Baba Neem Karoli in 1950 and is located close to Ashram of Bapu Lila Sah and Shitla Devi temple. It also offers a beautiful vista of sunrises and sunsets. The Mall Road of Nainital, which runs parallel to the Naini Lake, connecting the two ends of the hill town, is the prime shopping, food and cultural centre of the wonder that is Nainital. Whether it is digging into some luscious food or shopping for the cutest local woollens that are to be found, Mall Road is your go-to for it all. Established in 1984, Pt. G.B. Pant High Altitude Zoo or Nainital Zoo is situated on the Sher ka Danda hill in Tallital, Nainital. Perched at a height of 2100 metres and spread over an area of 4.6 hectares makes it the only one of its kind. The zoo is home to several endangered species and is a popular tourist spot. Kainchi Dham Ashram was established in 1962 by Maharaja Neem Karoli Baba. Perched at a height of 1400 metres, the ashram also has an adjoining Hanuman Mandir. The temple and the ashram is visited by thousands of people especially on the 15th of June when an elaborate bhandara is held. Reportedly, 1 lac people are fed in the bhandara. Nainital Ropeway or the Cable Car Ride is the most popular tourist attraction in the city of Nainital. The ropeway connects Mallital to the Snow view point- from the base to a height of 2270 metres. The aerial trip hovering over the Naini lake and the valley offers panoramic views of the breathtaking landscape. At a distance of 12 kms from Nainital, Khurpa Taal is another pristine lake situated at an elevation of 5500 feet. Laced with tall trees, the lake is considered ideal for fishing owing to its crystal clear waters and abundance of freshwater fish. Unexploited by tourism, the lake is a secret haven replete with bounteous nature and idyllic locales. Located in the vicinity of the Mall Road in Nainital, Bhutia Market is the most popular street market in the city. Besides an extensive variety of woollens and winter wears, the market is popular for its sumptuous Tibetan food. Roadside stalls and eateries sell mouthwatering thukpa and momos among other regional food items. Perched on top of the Manora Peak in Beluwakhan, Nainital, Astronomical Observatory or Aryabhatta Research Institute of Observational Science (ARIES) helps you see the stars, celestial bodies, the moon and other heavenly bodies with the help of high powered, imported telescopes. The centre requires you to make prior appointment before visiting the place. Located near Kaladhungi, Sariya Tal is an artificial lake constructed as a tourist spot. The tiny lake has numerous activities like paddle boating and water sports. It is also popular for Himalayan botanical garden which is a research centre other than being a herbarium and aa butterfly park. Located in the Kumaon Valley, away from the din of the city, Himalayan Centre of Sri Aurobindo Ashram aims at helping its visitors attain, peace, health and relaxation of mind through yoga and meditation. The ashram conducts regular workshops, talks, training programmes for stress management and regulating the lifestyle. The former abode of the British hunter, conservationist, naturalist and author- Jim Corbett is called Gurney House. The charming colonial cottage has a tiny museum with the achievements and life story of Jim Corbett. A quaint little nursery is also housed in the premises with a variety of shrubberies and plants. The house can be visited on prior appointment. Binayak is a small village panchayat near Nainital in Pithoragarh district of Uttarakhand. Naina Peak (also known as Naini Peak) is the highest hill peak and one of the most popular tourist spots of the city. Locally known as China Peak or Cheena Peak, the peak has a verdant green forest cover and offers a bird's eye view of the valley below in addition to panoramic vistas of the adjoining Himalayas and the Kumaon region. Situated adjacent to the High Court of Uttarakhand in Mallital, Nainital, St John Wilderness Church is the oldest and one of the best churches in Nainital. Perched atop a hill amidst beautiful pine and deodar trees, the church is constructed in Neo-Gothic style of architecture and has beautiful tainted glass windows.